Episode 044 of the Mountain Mantras: Wellness and Life Lessons show features my guest Kate Sciandra. Kate is is the go-to expert in applied mindfulness. An internationally published author, teacher, consultant, and speaker, Kate is a warm, funny, and purely authentic voice on the subject of paying attention to living. She draws on her wildly varied life experience, giving her a unique ability to make unexpected connections, turning assumptions about the nature of mindfulness, compassion, and well-being on their heads. From training of healthcare professionals, to webinars for Project Management Institute, from adolescent volleyball players to attorneys, she’s been teaching for over 20 years. Mantra #5: Follow Kate’s four tips to easily bring mindfulness into your work day: 1) take a deep breath, 2) make breaks about sensory experiences, 3) eat mindfully, and 4) ask a question, and REALLY listen to the answer. A gift for YOU in the new year: If you are interested in getting your New Year off to an amazing start, please click here to receive a free ebook, Six Steps to Your Amazing 2018. You can also get a free copy of Mantra #3: Zoom Out for the Best View (where I talk about mindfulness) from my first book, Mountain Mantras: Wellness and Life Lessons from the Slopes. …and the answer is that I followed some profound advice from two key mentors, Marci Shimoff (a #1 NYT Bestselling author) and Debra Poneman (a success expert). Today I’m happy to share a FREE life transforming eBook, The 4 Biggest Mistakes that Keep You from Living a Miraculous Life by these amazing women. Even if you just skim through the chapters you’re going to find easy-to-follow steps to help you unlock daily miracles that are hiding just beyond your reach. P.S.S. 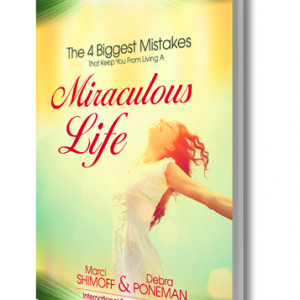 When you request your eBook, The 4 Biggest Mistake that Keep You From Living a Miraculous Life, you’ll also have the opportunity to claim a free spot in Marci and Debra’s upcoming 3 Secrets to a Life Filled with Miracles LIVE web event. I think you’ll LUV IT!